Join Our Affiliate Program And Start Earning Today! 1. How Can i Join affiliate program? Just fill the Affiliate Signup Form. You’ll receive a confirmation email on your mail id, by clicking on it you can activate your account and you’ll get all the required links and banners of product. Now you can start selling theme. 2. Is there any limit for selling theme? 3. When do i receive my payments? After reaching $100 you’ll be paid. Your commission amount should be $100 or more than that. We will pay you in first week of every month. 4. How does this program works? Refer our products to customer and earn profit when customer purchase the product. Banners and links are provided by us for promoting the product. And once a product is purchased with your link, it will be tracked by our program and you’ll get your commission in your account. 5. Does you take any charges to become affiliate? No, we don’t charge for it. Just complete the registration process and start selling. 6. Can i promote your themes on more than one websites? Yes, you can promote them on many websites. – You are not allowed to purchase theme with your own affiliate link. If found guilty then your account will be closed without any prior notice. – Promoting theme using any coupon code or using any website which works on coupon code won’t be allowed, Doing so means you are not following rules of affiliate program and your account will be removed. 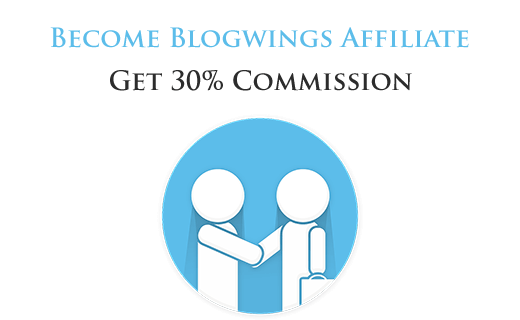 – You cannot use our companies name “BlogWings” to promote theme. because it will conflict brand name.